EMS designs and fabricates Piping Assemblies, ranging from 2” to 24”, ANSI 150 to 1500# ratings, in addition to Regulator and Instrumentation Systems to AGA, API, ASME, and GPA Standards. Town Border Stations, Regulation/Filtration Packages, and Flow Control Automation Systems are manufactured to either EMS standards or the Purchaser’s and Pipeline Specifications. Skid Units, from 6’ to 70’ long and up to 12’ wide, are designed and manufactured to the Customers’ Criteria. These skids are capable of supporting a simple 4’x4’ building or a complex Classified Regulation and Computer Controlled Building and System. Our Non-Classified Hazardous Waste Containment Buildings are fabricated with a floor grating to enable hazardous waste products to flow into a holding pan with drains. CAD drawings are generated for each project by our own CAD Department. EMS has built over 20,000 Natural Gas Orifice Meter Runs, of which 60-70% are skid mounted and many with EMS Buildings and Enclosures. Additionally EMS has fabricated hundreds of Turbine, Ultra Sonic, and PD Meter Systems, along with specialized pipe spools and complex piping assemblies. EMS also offers pipe design, instrumentation packaging, and fabrication outside the Natural Gas Industry. Recent projects include numerous sizes of Pipe Spools for a research lab, several 8’x40’ Air Product Analyzer Buildings, and many Regulation and Metering Systems. EMS is also actively pursuing the export industry having exported Measurement Tubes, Regulator Systems, and Instrumentation Buildings to Mexico and China. What sets us apart from the “PIG IRON” suppliers is the expertise developed throughout the 65 years in the Natural Gas Measurement Industry. The many years of Instrumentation and Measurement Design Experience, along with our Field Measurement Expertise of our sister company, Thurmond-McGlothlin, Inc., TM, a Natural Gas Measurement Service Company since 1945, allows EMS to offer more than just welding and assembly to our customers. The association of EMS and TM have propelled both companies to be considered among the most knowledgeable and respected companies within the Natural Gas Industry. 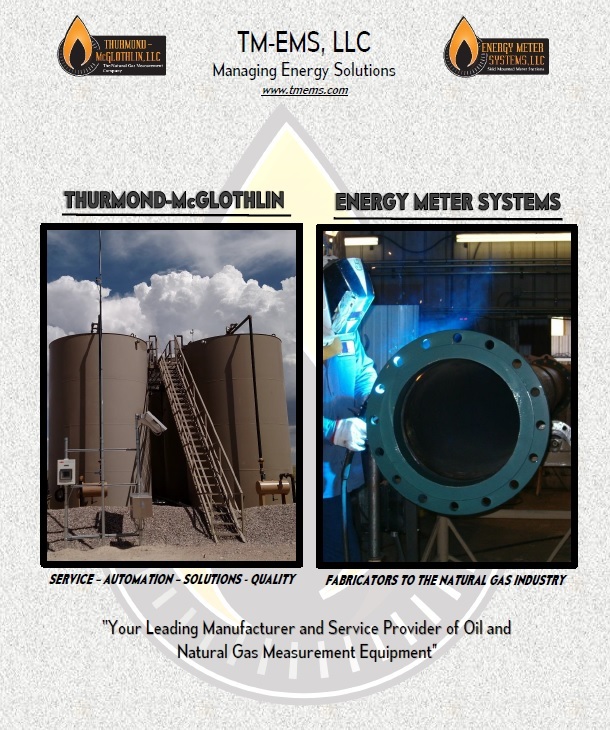 From the major oil/gas and distribution companies to independent operators, whether it is Measurement Equipment, Installation, or Start-up – Energy Meter Systems and Thurmond-McGlothlin are here to meet your Measurement Requirements.